What is the difference between T5, T8 and T12 lamps? Fluorescent lamps, or fluorescent linear tubes as they are also known, are categorized according to their wattage, shape and diameter. 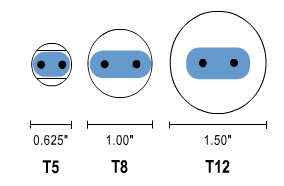 The "T" in T5 indicates the bulb is tubular shaped, while the "5" denotes that it is five eighths of an inch in diameter. The other common lamps are the larger T8 (eight eighths inch = 1") and T12 (twelve eights inch = 1½" tubes). The T12 is an older generation fluorescent bulb that generates light through electromagnetic induction, which is considered less efficient method of creating light compared to that of newer electronic based circuits. Like the T5, the T8 tube creates light through advanced electronic circuits and are available in standard 2, 3, 4, and 5 foot lengths. However, what sets T5 fluorescent lights apart from T8 bulbs is their dramatic reduction in size. T5 lamps are 40% smaller than T8 fixtures, but are capable of containing just as much and sometimes more light in a smaller area. In other words, more T8 fixtures are needed to produced the same amount of light generated by significantly fewer high output T5 bulbs. Although the newest T5 lights generally cost more than T8 models, they are lower maintenance than other fluorescent bulbs. This combined with the T5 bulb's ability to provide more light (lumen) than the other bulbs means long-term cost savings on your commercial and residential projects.